Toucan bird a photo by doug88888 on Flickr. 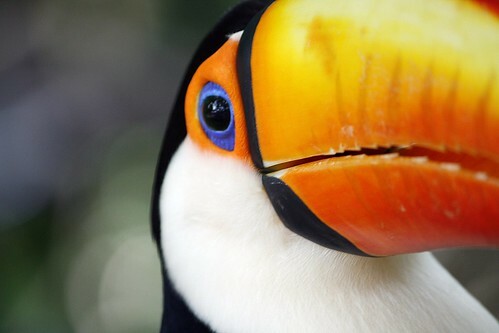 Toucan bird - Taken in Brazil. There can't be any bird as photographic as the Toucan. The Toucan BEGS to be photographed. They are curious, photogenic and comical. The beaks are extremely striking. The colours - orange, yellow, blue around the eye and black and white body are heaven sent to the camera. All a toucan would need is a little green belly and you would have the whole rainbow of colours. This particular Toucan took a great interest in my 250mm lens. I think he was a bit of a poser. So whilst his Toucan bird friends steered clear, he was constantly pushing into my lens. It was the first encounter I've ever had with the Toucan, I pray that its not my last. They are the most awesome of birds.